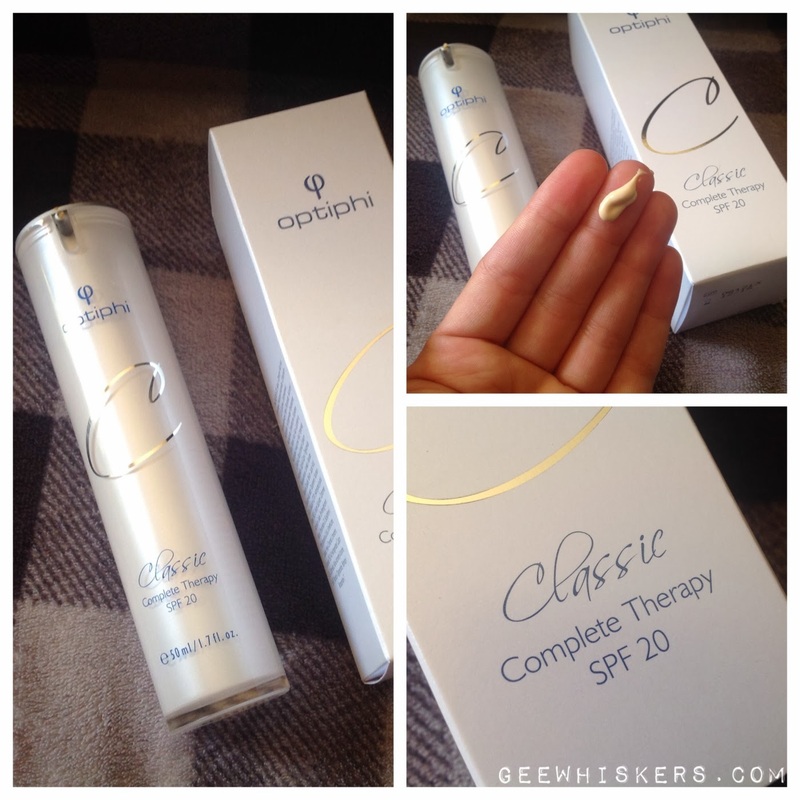 Optiphi Classic Complete Therapy Moisturiser / Gee Whiskers! My favourite product in the Cape Town Blogger Meet goodie bag has to be the Optiphi Classic Complete Therapy moisturiser. This moisturiser is a skin calming regulator and works deep within your skin to rejuvenate and restore you skin. This is achieved by the amazing ingredients which includes a good dose of Retinol and powerful antioxidants. The moisturiers works to completely protect and care for your skin by offering complete skin hydration, anti-wrinkle qaulities, skin restructuring and repair. Added to this is also an SPF of 20 which is higher than most moisturisers on the market. The moisturiser comes in an airtight tube with pump action to release the product. I personally love this because you are ensured that all the ingredients will remain active for longer as they aren't exposed to sunlight or air. Also means you can't get any dirt or bacteria into the product. I find that 2 pumps is more than enough product to cover my entire face, neck and chest area. My skin looks and feels beautifully hydrated with this moisturiser and what also really impresses me is that it achieves this without wearing heavy on my skin. In summer it is so horrible to have thick, heavy cream on your face that makes your skin look greasy. This absorbs beautifully into the skin and keeps it moisturised throughout the day. I definitely want to look into more about this brand because it truly has impressed me so much. Optiphi has two ranges - Active products and Classic products. The Active Products are more high end and out of the price bracket that some people can afford. That is why Optiphi created the Classic range to cater for the market who want great products but cannot afford the more expensive Active range. It is something that I can appreciate because I am really into my skin care and am horrified at the cost of some products. My Top Tips: A good skin care routine needs great products which can be very expensive. Start your collection off with a great moisturiser and face mask. Each month set aside some money to spend on your next purchase. This helps to offset the major cost when you next make your purchase. One needs to remember that most skin care products last around 2 -3 months (if not longer) so you have time to save up. Birthdays and Christmas I always ask for some of my staple skin care products or gift vouchers. This helps offset the cost and allows me to build up a good stash of facial care products. Over time I have built up an impressive collection of products that make my "at home facials" equally as good as ones at salons / spas. Hope these added tips are useful and let me know what you think of the moisturiser. My favorite Revitol dermasis cream would be a great combination wit this amazing product.